Sometimes it’s easy to do something that will have others question your good sense. For example, earlier this month I asked people if they had a spare ticket to the Bills’ first preseason game. Really. I was free the night that the Bills played the Minnesota Vikings early in August, and I figured I’d get a head start at looking at the team – as long as I didn’t have to pay for it. I hadn’t been to a preseason game in a few years. A group of friends who have season tickets together responded to my request by saying, “How many tickets would you like?” One was enough; company is difficult to find for such occasions. I parked in the ECC-South lot, and was told that parking was going up to $25 per car for the regular season opener in September. It was nice to get the $5 discount that night, as it was about the only thing on sale for the game. The parking lot across Abbott Road from New Era Field was quite empty, giving the walk to the stadium a somewhat spooky experience. The preseason game itself was rather typical as these things go. The starters showed up for a quarter or so, and then exited to the bench for the rest of the evening. They were followed by the usual players who are slated to either see spot duty during the regular season, or will need a ticket to get into an NFL stadium once September rolls around. I took a walk around the stadium at halftime, and was a little surprised by how many people were heading out the door. I also noticed that foot-long hot dogs were $9, about twice what Ted’s charges. Obviously, the concession stands were in regular-season form. While my heart was telling me that a thrilling last-minute finish to the game was at least possible because of the score, my head reminded me that the teams didn’t have the talent on the field or the continuity to pull something like that off. The Bills lost, but at least the drive home was really quick. I suppose I got what I paid for. There’s one more home game on the preseason schedule, as the Bills and Lions match up at New Era Field on Thursday night. Tickets for that one are going for $6 each on Stubhub. 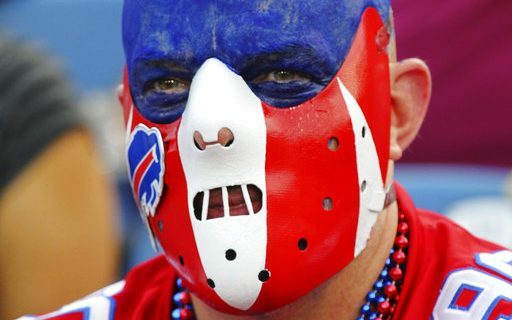 Most teams around the NFL – including the Bills – charge less for preseason games than for the ones that count, but it’s still something of a surcharge for season-ticket holders. Even NFL Commissioner Roger Goodell has said that the current system doesn’t work too well. He’d like to reduce the August schedule by at least one and maybe two games. The price scale for preseason sports is never an easy one. When I worked for the Sabres, I asked someone why there wasn’t a discount for games that didn’t matter. I was told that no one would pay anything for preseason games if they could avoid it, so the team simply charged full price. At least it was only two games out of a total of 42 back then, so on a percentage basis it wasn’t much of a surcharge. In fairness, the Sabres have changed that policy since then. Baseball doesn’t have the problem of adding to the bill of its season-ticket holders, since its preseason games are played in warm-weather climates. In hockey, when games are played in NHL rinks, the visiting team often doesn’t even bother bringing its best players to town. Baseball and hockey do have the advantage of “farm systems,” which means that playing rosters for preseason games are filled out with players who might turn up in the major leagues in the months and years ahead. The games become a chance for fans to do a little scouting. Football has a practice squad, but it’s not the same. Meanwhile, the risk of injury to a player in a particular game is less in baseball and hockey than it is in football, where it can only take a bump in the head to end a season or career. Remember Kevin Kolb’s stay with the Bills? All right, we agree that preseason NFL games will never be rated a “best buy” by Consumer Reports. But what can be done about it? Momentum seems to be growing toward eliminating the final preseason game, as the idea has been often discussed by the NFL’s Competition Committee. That’s the one where the best players never get off the sidelines. You’d essentially have a bye week for everyone at the end of preseason, and perhaps a scrimmage with a nearby team could be added to training camp somewhere on the calendar to replace it. That would be a step in the right direction, although eliminating a second game of the four – probably the first one – might be even better. Still, such moves would reduce the amount of revenue the sport would take in. That concept would get the attention of the Players Association, which usually isn’t too happy with the idea of pay cuts for its membership. A related idea might be to add up to two games to the regular season, so that the schedule goes to 18 games with two preseason contests. Goodell once floated that idea, but the players pointed out the extra injury risks involved in that schedule. Lately the Commissioner has talked about 17 games, which is a little ugly in terms of scheduling. But the current 16-game slate is a good fit on the calendar. This is one of those issues that comes up every August, and – like the results of those summer games – is forgotten as soon as the season opener is a week away. Maybe we should try to remember it for a longer period of time and work harder on a solution. Visit Budd Bailey’s Page on Buffalo Sports Page for his observations on WNY Sports.